Starring: Tyler Perry, Matthew Fox, Edward Burns, Rachel Nichols, Jean Reno, Carmen Ejogo, and Cicely Tyson. After seeing Silver Linings Playbook on Monday, I remarked once again what an excellent year it’s been for movies. “There’s been one great film after another!” I exclaimed. However, I might need to recant my statement now that I have seen Alex Cross. For every Silver Linings Playbook this year, there has been an Alex Cross. While some film circles are yielding greatness upon greatness, others are cranking out brainless trash ad nauseam. 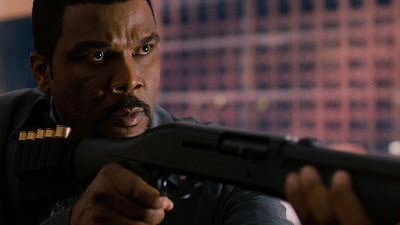 Alex Cross is an excellent example of how Hollywood is consistently scraping the barrel to make a quick buck. The film is a redundant reboot of the Alex Cross series that starred Morgan Freeman in 1997’s Kiss the Girls and 2001’s Along Came a Spider. I quite enjoyed the Freeman films (and the James Patterson novels on which they are based), but Alex Cross feels like a franchise that has long been stiff with rigor mortis. A check-in to Alex Cross should be rewarded with a Get Glue scratch-n-sniff sticker that reeks of fetid corpse. Armed with a doctorate, which he must have got at clown college, Detective Dr. Alex Cross is smarter than the average bear. It makes little sense, then, when he throws good logic to the wind and becomes a shotgun-wielding vigilante. This film follows the trend of most reboots and does a descent into darkness, but unlike Batman Begins or Casino Royale, Alex Cross backfires to the most laughable degree. It’s a film that’s been corrupted by a decade of z-grade procedurals on TV. Alex Cross tries to show that it has bigger brains—the characters actually remark how it takes more than forty-five minutes to get the job done. The new Alex Cross is not the suave thinker he was before; instead, he’s a ripped Rambo who plays connect the dots with convenient clues. Tyler Perry throws away every shred of respectability he earned for directing For Coloured Girls by stepping into Freeman’s shoes to play Detective Dr. Alex Cross. Tyler Perry is no Morgan Freeman. The disparity is not quite as bad as, say, a remake of Sophie’s Choice with Madonna place of Meryl Streep, but Perry lacks the gravitas, timing, and presence to sell any of the film’s convoluted logic or action. Perry is outdone by his co-star Matthew Fox as Cross’s serial killer nemesis “Picasso”, who draws charcoal portraits of his victims for reasons unknown. If Perry is out of his depth, then Fox is indescribably bad, not to mention alarmingly gaunt. This film hardly demands much from its actors, so the extra effort amounts to distracting vanity. Picasso’s anorexia is another of the many things that go unexplained in Alex Cross. Alex Cross, on the other hand, hardly begs for logic. Scripted in a cut-and-paste job of clichés and one-liners from Criminal Minds and seemingly edited with a butter knife, Alex Cross is a by-the-numbers cat and mouse thriller. It struggles to realize that one plus one equals two, but the only pleasure afforded by the film is watching how clumsily director Rob Cohen it rolls Perry along. Perhaps the silver lining of duds like Alex Cross is that they make us appreciate the great films even more. Alex Cross is currently playing in Ottawa at Empire Kanata.